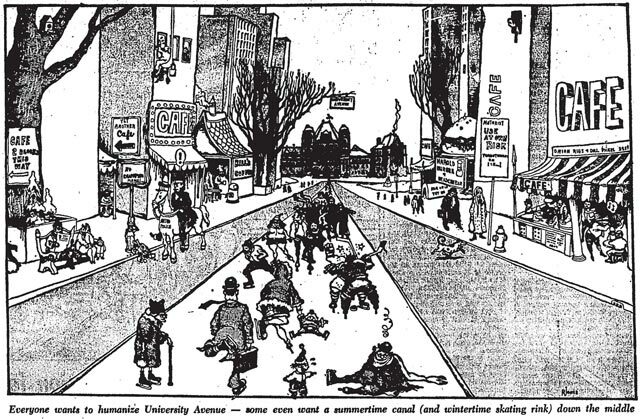 Illustration by Randy Jones, the Toronto Star, January 2, 1971. “How can we make Toronto a more pleasant place in which to live in 1971 and the years beyond? Not bigger or wealthier, but more pleasant?” That was the question the Toronto Star asked a series of local dignitaries as a new year began. The result, a four-page spread published on January 2, 1971, revealed a mix of fanciful thoughts, trendy ideas, and quality of life issues we’re still grappling with. When the article appeared, there was a growing sense that development was so rampant that the city needed to be brought back to a human scale. Downtown was changing rapidly, as generations of buildings gave way to gleaming office towers and temporary parking lots awaiting their transformation. As concrete, glass, and steel filled the landscape, there were calls to scale down buildings and find room for green space. The city council elected in 1969 split into pro- and anti-development factions. The fight which dominated headlines in 1971, the halting of the Spadina Expressway, illustrated the growing power of citizens in tackling projects that threatened to destroy neighbourhoods. How that battle was resolved likely sat poorly with writer Hugh Garner. One of the few cranky voices in the Star’s spread, Garner felt the city would improve if city council denied hearings to “fanatical minority groups who fight and delay every improvement, and who put ‘participatory mob action’ above the democratic process of electing their representatives to a municipal body.” He believed city council suffered from extreme procrastination, fearful of pushing any large-scale project. He noted how infrastructure like the Don Valley Parkway, Gardiner Expressway, the subway, sewage improvements, and the new City Hall were built in the face of heated opposition. 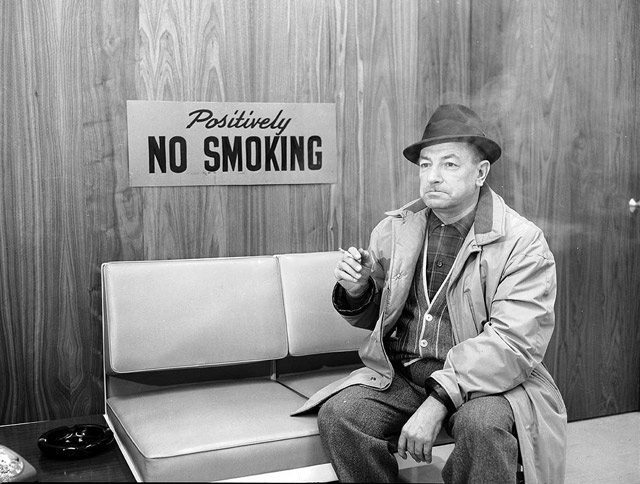 Hugh Garner disobeying an anti-smoking sign, 1950s. City of Toronto Archives, Fonds 1257, Series 1057, Item 3051. Along similar lines was Mayor William Dennison’s response, which defended city drivers. The enjoyment of a modern city depends on transportation because what pleasure can the individual get if his enjoyment is to be confined only to those areas which he can reach on foot? It would indeed by a major error if, in the name of progress, we were to hinder progress. Obviously, rational decisions must continue to be made. Council must try to do this without making the kind of emotional mistakes which come when council members are forced to make quick, off-the-cuff decisions about things, under pressure, from single-purpose lobbyists. Dennison’s thoughts were isolated, as many respondents wanted pedestrian zones in the core. Ideas ranged from writer June Callwood’s proposal to pedestrianize Kensington Market, Mirvish Village, and Yorkville, to Humber MPP George Ben’s suggestion to block cars between 6 a.m. and midnight in an area bounded by University Avenue, Bloor Street, Jarvis Street, and Front Street. “By 1975 we shall all be wondering however we put up with automobiles and trucks in our daytime city core streets for so long,” Ben observed. Architect John C. Parkin envisioned a system of landscaped pedestrian malls spreading spoke-like from the core, using Dundas Street by the AGO as an example. Yonge Street Mall, looking north from Queen Street, 1971 or 1972. City of Toronto Archives, Fonds 200, Series 1465, File 312, Item 55. Most pedestrian zone suggestions focused on the city’s main drag, which came to fruition quickly. 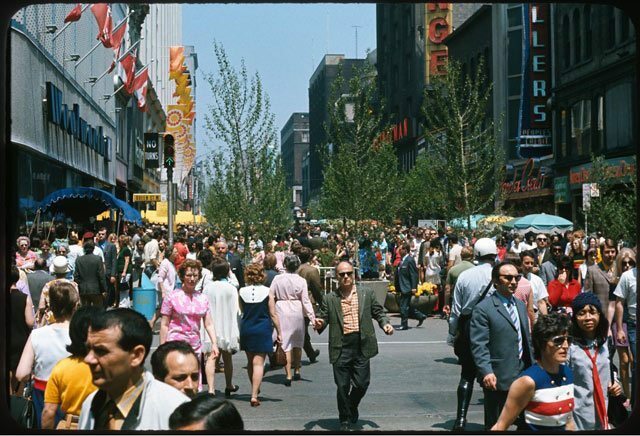 The first Yonge Street Mall pilot, running between Albert Street (now part of the Eaton Centre) and Adelaide Street, opened on March 30, 1971, and was initially viewed as successfully restoring a sense of community. “It has brought back an enjoyable thing that used to exist only in small towns on a Saturday night,” Globe and Mail columnist Bruce West observed after its opening, “I refer to the simple pleasures of ambling up and down Main Street meeting your fellow residents eye-to-eye and even venturing to bid them good evening.” Despite expansions in succeeding years, concerns about crime and traffic congestion ended the experiment in 1974. The idea of car-free zones continues through Kensington Market’s Pedestrian Sundays and, despite uproars in certain quarters, this year’s Open Streets TO pilots. 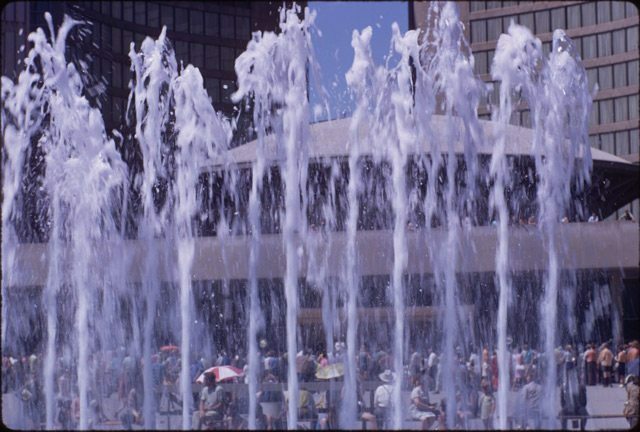 Close view of water fountain in Nathan Phillips Square, July 1, 1971. Photo by Harvey R. Naylor. City of Toronto Archives, Fonds 1526, File 11, Item 31. Among the elements Toronto has long scrimped on is bicycle infrastructure, which was creeping into the public consciousness in 1971. Readers may sympathize with the concerns of University of Toronto social work professor Dr. Benjamin Schlesinger. “If a family with five bicycles (such as mine) attempts to ride anywhere in town,” he noted, “they will encounter impatient tooting of horns by our anxiety-ridden motorists, cars that nearly crash into them, and pedestrians who stare as if to say ‘look at this strange species, on two wheels.’” While Schlesinger’s dream of closing part of Lake Shore Boulevard on Sundays for cyclists didn’t occur (though you could argue the Martin Goodman Trail took care of this), a suggestion to convert the Belt Line into a path was realized. One way to make Toronto a more pleasant place in which to live is to put on a guard rail about four feet from the curb, running parallel to it. This narrow lane would provide more space for bicycles. Today more and more people of all ages are cycling. Housewives who live in the suburbs can be seen shopping with bicycles. Driving through Europe I have noticed an elderly nun cycling along the road with a stick of bread unwrapped in her carrier. Copenhagen provides these lanes for cyclists with great success. Who knows how local transportation infrastructure history might have changed had Mirvish turned separated bike lanes into a personal crusade. 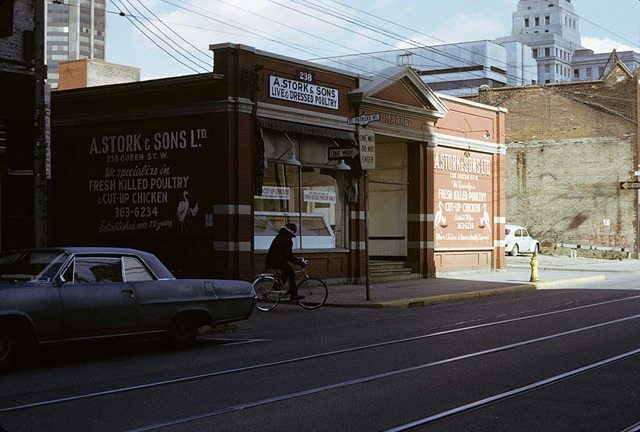 A cyclist riding in front of St. Patrick’s Market on Queen Street, 1970s. Photo by Ellis Wiley. City of Toronto Archives, Fonds 124, File 2, Item 125. To balance development and the human environment, Councillor David Rotenberg believed developers should follow the model of recent improvements to public spaces like the construction of Nathan Phillips Square, the restoration of St. Lawrence Hall, and the expansion of St. James Park. “Imagine, if each new building provided some type of exterior designed environment for everyone’s use,” said Rotenberg. “Things like fountains and sculpture, landscaping and displays, graphics, light, and sound. Within a few years Toronto could become a permanent Expo, a city for all to visit and for our own people to enjoy. Instead of driving through the downtown core, people would walk in it and enjoy it.” In some ways, this foreshadows the use of Section 37 funding by builders skirting density and height requirements. Two respondents, High Park MPP Morton Shulman and YMCA director of promotion and development Robert Bradley, tackled the issue of Exhibition Place. Both suggested a replica of Copenhagen’s Tivoli Gardens as a year-round attraction with concerts and amusement rides. Later that year, Metro’s parks and planning department issued a report which would have radically altered the site by moving the midway elsewhere, demolishing 14 major buildings, and building an elevated rail system to connect new and surviving structures. Though Metro council adopted the report, provisos to maintain the midway and keep Exhibition Stadium until a replacement was built elsewhere killed it. Speaking of stadiums, respondents like Senator Keith Davey and former mayor Nathan Phillips pitched a dome to bring a major league baseball franchise to town (the team arrived first—12 years passed between the Blue Jays’ debut and the opening of SkyDome). But grand, “world class” development suggestions were few in the article. Among them was deli owner Sam “Shopsy” Shopsowitz’s call for a “World University of Toronto” dedicated to addressing global issues. He proposed American anthropologist Margaret Mead as its first president because “she is internationally respected by young people and has contributed tremendously to the understanding of man and his world.” Shopsy’s pal and Loblaws executive Leon Weinstein offered one idea that took 40 years to become reality (an aquarium) and another that would still be helpful (a multilingual ombudsman who paid regularly-scheduled neighbourhood visits to hear citizen concerns). The longstanding quest for a comprehensive Toronto historical museum was discussed by Canadian Music Centre director Keith MacMillan, whose ideas included panoramic displays and a reconstruction of 19th-century Yonge Street. Conflicted over building a grand landmark and maintaining a human touch was “Toronto’s famous communications expert,” Marshall McLuhan. “Toronto could be a more pleasant place to live in if we could banish from our aims and goals the desire for moreness,” McLuhan observed. 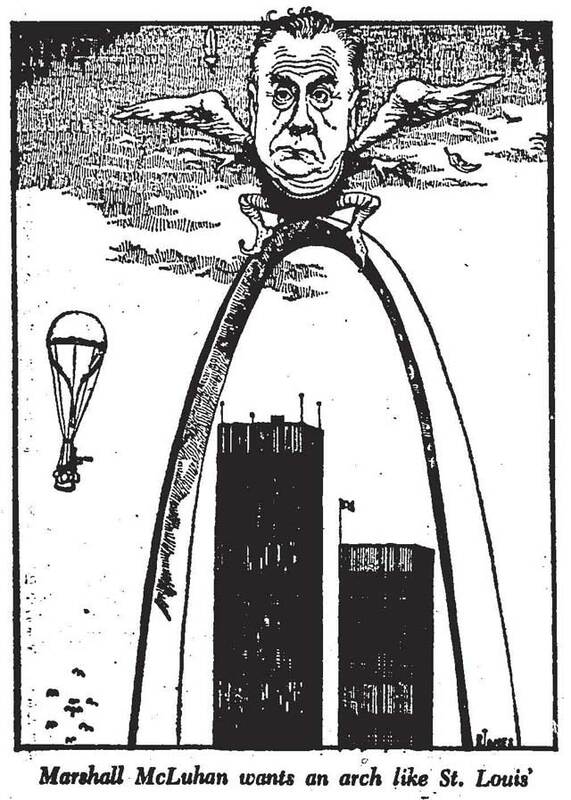 “With moreness there is the disappearance of human scale and the dominance of dialogue and friendship as the basis of community.” His suggested improvement was a giant archway, a la St. Louis. “This vast stainless steel bow in the clouds centres the vision of an entire city in a perpetual dance of shades, textures and patterns. It could frame the Toronto-Dominion Centre itself.” We encourage artists to play with McLuhan’s concept during a future edition of Nuit Blanche. Growing the city’s green space factored in many responses. Growing concerns about the environment, especially air pollution, influenced many of these thoughts. Expropriation of land within neighbourhoods to be converted into park space was a common thread: June Callwood suggested one vacant lot per block would do, while Holy Blossom Temple rabbi W. Gunther Plaut thought buying houses in twos or threes would suffice. Sam “The Record Man” Sniderman encouraged “a thriving farmer’s market where the freshest and best of the surrounding countryside can be purchased on a grower-to-consumer basis.” Never realized, perhaps to the relief of some, was John C. Parkin’s suggestion to create a “Provincial Capital Commission” along the lines of Ottawa’s National Capital Commission. Return to ideals which made us great, substituting humanitarianism for violence, personal and business initiative and integrity for sponging and patronage, quiet good taste for screaming ostentation. Help everyone to find a useful and dignified role in society instead of trying to buy off poor, young and old with contemptuous alms. Additional material from Unbuilt Toronto by Mark Osbaldeston (Toronto: Dundurn, 2008), the June 4, 1971 edition of the Globe and Mail, and the January 2, 1971 edition of the Toronto Star.